European leagues are free to schedule domestic games on the same nights as Champions League and Europa League ties after an agreement with Uefa ended. "This will give all European Leagues total freedom to schedule their matches as they see fit," said the European Professional Football Leagues group. The agreement ended on 15 March. It had been in place between the EPFL and Uefa to boost attendances and television viewing figures for European matches. 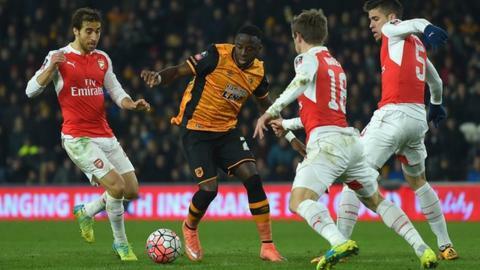 Arsenal's FA Cup replay against Hull City in March 2016 was given special dispensation to be played on the same night as the Champions League last 16. Manchester City hosted Stoke City in a rearranged Premier League fixture last month on the same night as the Champions League last-16 ties between Barcelona and Paris St-Germain, and Borussia Dortmund and Benfica. The Premier League said the scheduling of the match on Wednesday, 8 March was "unavoidable", it was reported. It was also reported in April 2013 that the Football Association was fined £1.1m for allowing domestic matches to be played on the same night as European games. The EPFL said it will hold a general assembly of its member leagues in Geneva on 6 June.